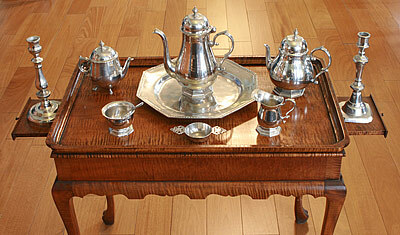 For decades, the epitome of a pewterer’s craft was a tea or coffee pot. Our tea pot is done in an early style with a slip fit lid and the coffee is a little later period with the hinged lid. Both are made of lead free pewter. The bodies are spun on the lathe, each from one piece of metal. Handles, spouts and the hinge are cast. The tea pot spout is cast in an antique mold. The octagon foot is also cast, while the round foot is spun on the lathe. Pieces are joined with wire made of the same alloy as our pewter. The pot on the left is a chocolate pot. Until fairly recently, chocolate was a spicy, often bitter, beverage and was used primarily for medicinal purposes. It was prepared in small pots like this and served in small cups with cream. Each piece is lovingly hand finished and all work is done in our shop in Louisiana, MO. Each piece is priced individually, and all are available by order, with round foot or octagonal foot. The candlesticks and charger shown are cast in antique bronze molds that date to between 1780 and 1810. Those original molds were made in Philadelphia, PA.